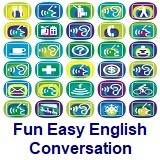 ﻿ Fun Easy English - new american english standard conversation Voice of America VOA learning English for beginners lesson 6 Where Is the Gym? discourse. Lesson 6 - Where Is the Gym? In this lesson Anna is looking for the gym in her new apartment building. She meets Pete and he gives her directions. Anna finds many different places in the apartment building. Finally, she finds the gym. Anna: Hi there! I’m Anna and I live in Washington, D.C. Every day I learn more about this great city. People in Washington like to work out! Oh, hi, Pete. How’s it going? Pete: Hi, Anna. It’s going great. How’s it going with you? Anna: Things are awesome! Pete, I want to work out. Where is the gym? Pete: The gym is across from the lounge. It’s next to the mailroom. Go that way. Pete: No, Anna! Not that way! Go that way! Anna: Oh, Pete. This is not the gym. Pete: That’s right, Anna. This is the mailroom. Anna: The gym is across from … what? Pete: The gym is across from the lounge. Anna: Across from the lounge. Right. Thanks! Anna: Pete! This is not the gym! Pete: The gym is across from the lounge. It is behind the lobby. Anna: Right. Right. See you. Anna: This is not the gym. This is a parking garage. Anna: This is not a gym. This is a rooftop. Pete: I want to work out too! Join me! 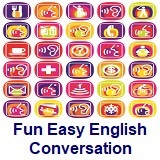 Watch the video and practice the new words and learn about using prepositions. 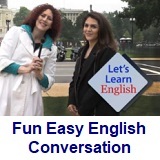 In this video, you ​learn about how Americans greet each other in informal situations. 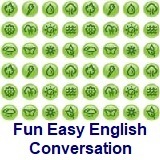 You will also learn how to ask clarification questions by beginning your sentence with a statement, then making your voice go up at the end of the sentence to form a question. parking garage – n. a building in which people usually pay to park their cars, trucks, etc. What are some of the rooms in your house? Write about it in the Facebook Comments section below. Tell us what you do in the rooms. Do the activity and practice writing the names of rooms in an apartment building. Click lesson activity to get the printable PDF version. The page opens to a new window.